We are in the process of taking down our old window coverings and getting shutters next week. John is up and down the ladder and I am in charge of having bits and pieces handed to me and me handing up other bits and pieces as we move around the house. At the end of the day, who wants to cook!? So we rummage around the refrigerator. We have three different rices! There is white rice from Chinese take-out, brown rice from earlier in the week, and curried rice from two nights ago. Mix them all together, add some Asian flavors, and an egg, and we have dinner! 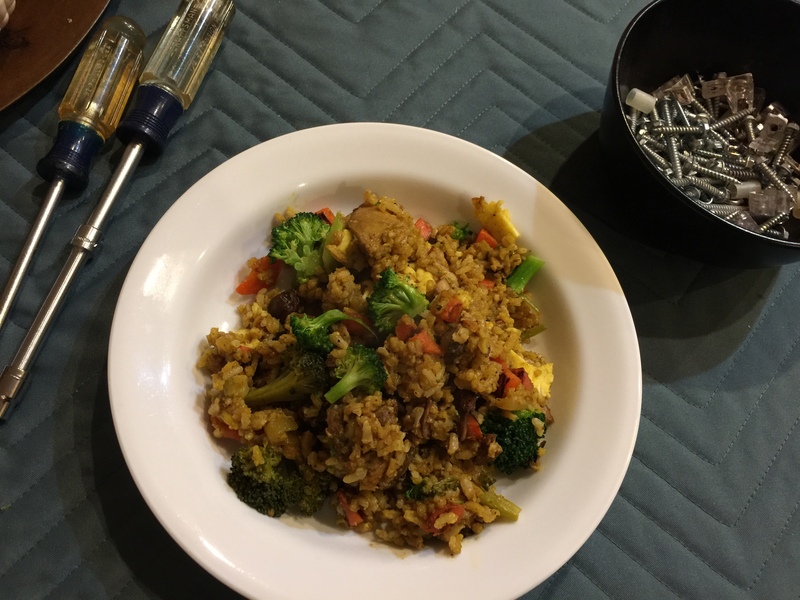 This entry was posted in Eggs, leftovers, Poultry, rice, Vegetables and tagged brown rice, Curry, Eggs, rice, Vegetables. Bookmark the permalink.